A few weeks ago, I emailed the Oxford college libraries’ mailing list, asking for people to respond to a short survey about rare books in college libraries. Here is a summary of my questions and the responses I received. I am indebted to the colleagues who took the time to reply to me and share some experiences of a little-documented aspect of college library life. If you would like to know more about college libraries at the University of Oxford, you might like to read my post Visit from another college librarian. 1. Is there a theme or particular background to your collection, or is it a more eclectic mixture of books of varying ages or values? Many collections are an eclectic mixture of books of a variety of ages and values. Some collections have particular strengths (e.g. in a specific subject) or consist of a large donation from a single person (in such cases, the identity of the donor adds interest to the collection). Some collections include objects other than books, such as globes. The libraries of older colleges (that is, centuries old) often have medieval manuscripts in their rare book collections. Rare book collections are usually housed separately from the main library. Conditions vary greatly: sometimes the rare book collection is in a quiet corner and seldom used; at other libraries, investment in the room itself has created a beautiful reading room in which to consult the collection. In many libraries, the rare book collection has not yet been fully catalogued. Some college libraries have special collections, whose constituent items may not be rare or particularly valuable but which collectively form a set which is important to researchers in a certain field, and is not easily found in other libraries. There is some doubt about how old or rare an item has to be before it qualifies for inclusion in a rare book collection. Most agree that pre-1800 is rare, and there is some uncertainty about the status of 19th-century items. 2. Is your rare book collection accessed frequently? May readers access titles simply by request? Is the room or reader supervised throughout the appointment? In most college libraries, readers must make an appointment to visit and consult a rare book. This visit will usually be supervised by a member of library staff. Such appointments are time-consuming for library staff who are then committed to remain with the reader until they have finished, and this may take many hours. Sometimes these visits take place in the main library, so staff can continue their usual work during the appointment, but this is more difficult in a rare books room which is separate from the main library. For most college libraries, such visits are infrequent (ranging from one a fortnight to a couple of occasions in nine years). A minority of college libraries (probably those with more substantial rare book collections) have more frequent requests for access – some as many as one every day. Some libraries have visits from small groups: sometimes a tutor and their students; or as part of a schools outreach programme. 3. Are any of your rare books used in exhibitions, whether in your college or further afield? 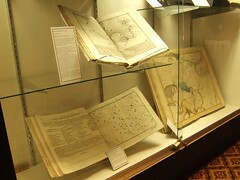 Many college libraries allow their rare books to be used in exhibitions within their college, and some loan items to external exhibitions (at the Bodleian and occasionally further afield). Some colleges lack the resources for such displays, e.g. space, lockable cases, security and supervision. 4. Do you have a specific budget for rare books: whether for their cataloguing, conservation, acquisition or other? Most college libraries have to fund-raise for specific cataloguing or conservation projects relating to their rare book collections. Few have a specific annual budget for this work. No colleges who responded to my survey have a budget for the acquisition of rare books. Many college libraries outsource their conservation and cataloguing work relating to rare books. A small number of antiquarian cataloguers work in college libraries, usually part-time or on fixed-term contracts. 5. Has the idea of selling or re-homing the collection ever been raised? If so, what was the reaction? Some college libraries have raised this issue and found that some academics were strongly opposed to the idea. In a few cases, some individual items have been sold. Collections maintained via grants are in a more complicated situation: no material may be dispersed without informing the grant-giving body. Similarly, for collections consisting of bequest material, the library committee or college are considered the guardians of that material in perpetuity. A few colleges have considered re-allocating material (e.g. collections of personal papers) to another library or archive which has the resources to commit to preserving them and making best use of them. However, such collections are often in a college to begin with because the author or donor had a connection to the college so the material has an important role to play in the history of the institution. It was noted that selling such items is difficult because a true valuation needs to involve an expert, and it can be difficult to ensure that this advice is impartial. 6. What is the role of your rare book collection in your library and in your college? Has the collection evolved by itself or was it planned? Is its value perceived as directly relevant to the academic activity of the college, or does it have a more emotional/historical role? Most college library rare book collections have evolved via donations and bequests, rather than as a planned collection. Many collections are not directly relevant to the academic activity of the college, and the rare book collection is seldom perceived as an important part of the library’s development strategy. It was also noted that there is a risk that special or rare book collections can be taken for granted and there may be a lack of understanding of how much expertise, time and money it takes to keep such collections in good condition and make them available to college members or visitors. Aaah … ‘visiting’ a rare book … that’s lovely!